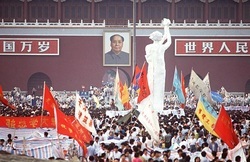 The Statue of Democracy was a 10-meter-tall (33 ft) statue created during the Tiananmen Square protests of 1989. The statue was constructed in only four days out of foam and papier-mâché over a metal armature. The constructors decided to make the statue as large as possible so the government would be unable to dismantle it. The government would either have to destroy the statue—an action which would potentially fuel further criticism of its policies—or leave it standing.